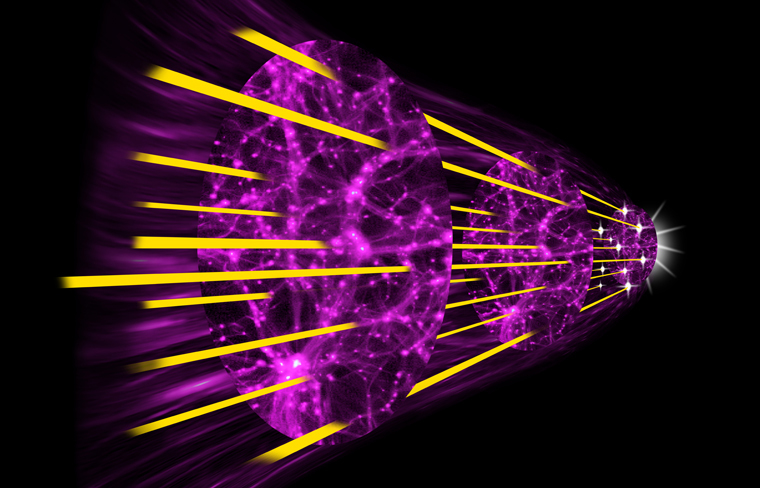 An artist’s conception of how BOSS uses quasars to measure the distant universe. These latest results combine two different methods of using quasars and intergalactic gas to measure the rate of expansion of the Universe. The first analysis, by Andreu Font-Ribera (Lawrence Berkeley National Laboratory) and collaborators, compares the distribution of quasars to the distribution of hydrogen gas to measure distances in the Universe. A second analysis team led by Timothée Delubac (École Polytechnique Fédérale de Lausanne, Switzerland) focused on the patterns in the hydrogen gas itself to measure the distribution of mass in the young Universe. Together the two BOSS analyses establish that 10.8 billion years ago, the Universe was expanding by one percent every 44 million years. BOSS determines the expansion rate at a given time in the Universe by measuring the size of baryon acoustic oscillations (BAO), a signature imprinted in the way matter is distributed, resulting from sound waves in the early Universe. This imprint is visible in the distribution of galaxies, quasars, and intergalactic hydrogen throughout the cosmos. As the light from a distant quasar passes through intervening hydrogen gas distributed throughout the Universe, patches of greater density absorb more light. Each absorbing patch absorbs light from the spectrum of the quasar at a characteristic wavelength of neutral hydrogen. As the Universe expands, the quasar spectrum is stretched out, and each subsequent patch leaves its absorption mark at a different relative wavelength. The quasar spectrum is finally observed on Earth by BOSS, and it contains the signatures of all the patches encountered by the quasar light. Astronomers then measure from the quasar spectrum how much the Universe has expanded since the light passed through each patch of hydrogen. With enough good quasar spectra, close enough together, the position of the gas clouds can be mapped in three dimensions. BOSS determines the expansion rate by using these maps to measure the size of the BAO pattern at different epochs of cosmic time. 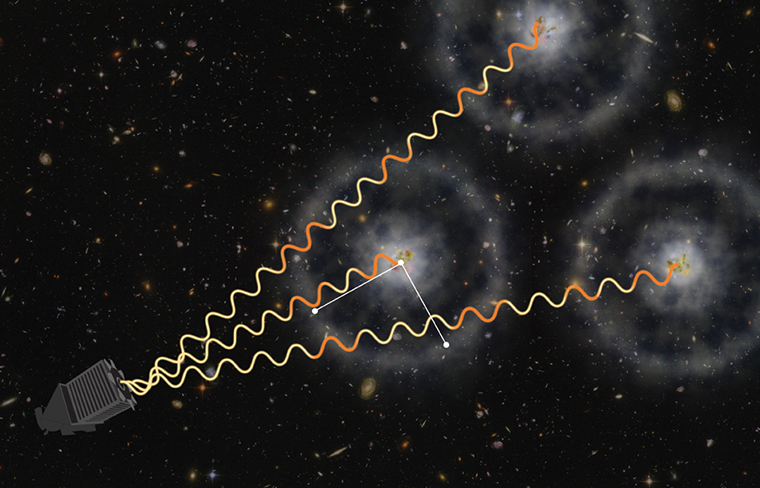 These new measurements provide key data for astronomers seeking the nature of the dark energy postulated to be driving the increase in the expansion rate of the Universe. 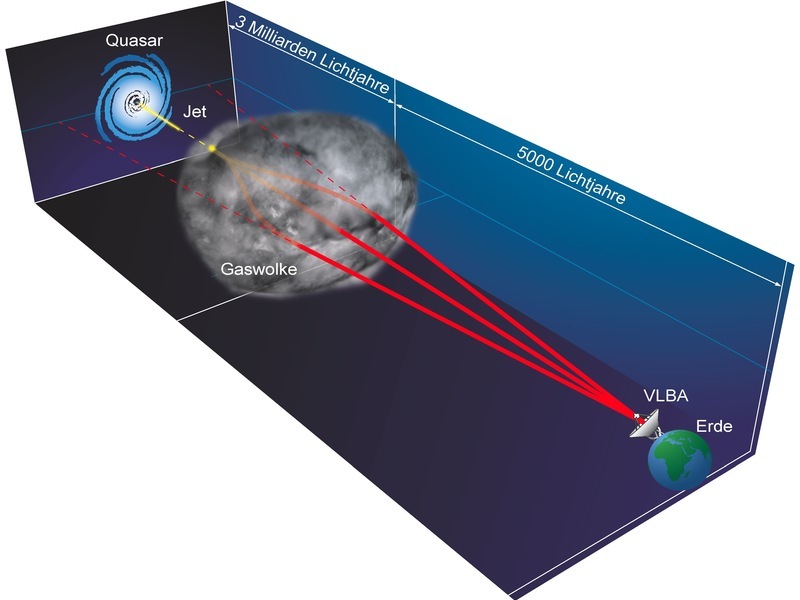 Artist’s diagram of the refraction event (not drawn to scale), showing how radio waves from the distant quasar jet are bent by a gas cloud in our own Galaxy, creating multiple images seen with the Very Long Baseline Array. Bonn astronomers discover how the image of a distant quasar splits into multiple images by the effects of a cloud of ionized gas in our own Milky Way Galaxy. Such events were predicted as early as in the 1970s, but the first evidence for one now has come from observations performed with the telescope array VLBA and analysed in the Max Planck Institute for Radio Astronomy. The scientists observed the quasar 2023+335, nearly 3 billion light-years from Earth, as part of a long-term study of ongoing changes in some three hundred quasars. When they examined a series of images of 2023+335, they noted dramatic differences. The differences, they said, are caused by the radio waves from the quasar being bent as they pass through the Milky Way gas cloud, which moved through our line of sight to the quasar. “So as we would see a spot of light get broader or even multiple behind a frosted glass, we see this quasar ‘dancing’ behind a gas cloud in our own Galaxy”, so Anton Zensus, Director at the Max Planck Institute for Radio Astronomy (MPIfR) in Bonn, Germany, and member of the international team who has discovered this effect. “This is similar to the fata morgana to be seen in the desert or to the Sun dogs caused by iced clouds with the image of our own star”, adds Zensus. “This event, obviously rare, gives us a new way to learn some of the properties of the turbulent gas that makes up a significant part of our Galaxy,” said Alexander Pushkarev from the MPIfR in Bonn, Germany, and the Crimean Astrophysical Observatory, Ukraine, and leader of the international team. 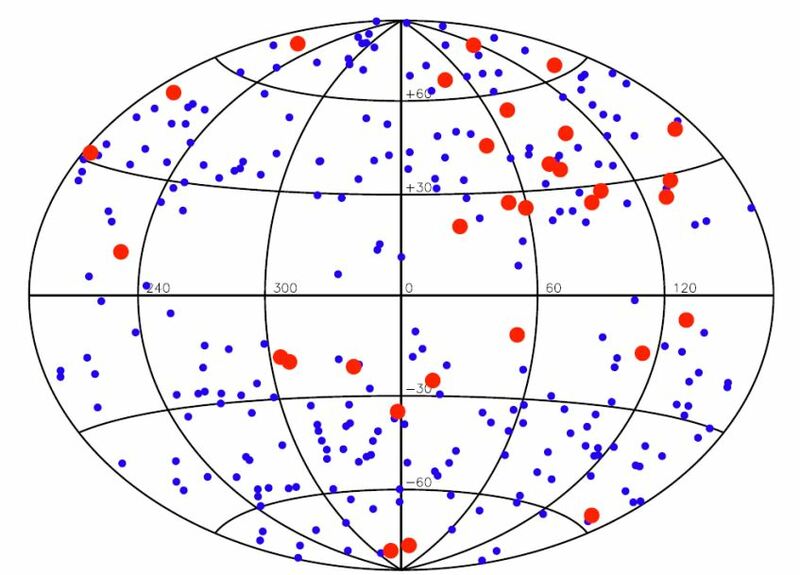 The scientists added 2023+335 to their list of observing targets in 2008. Their targets, in the framework of the MOJAVE project, are quasars and other galaxies with supermassive black holes at their cores. The gravitational energy of the black holes powers “jets” of material propelled to nearly the speed of light. The quasar 2023+335 initially showed a typical structure for such an object, with a bright core and a jet. In 2009, however, the object’s appearance changed significantly, showing what looked like a line of bright, new radio-emitting spots. “We’ve never seen this type of behaviour before, either among the hundreds of quasars in our own observing program or among those observed in other studies,” adds Eduardo Ros from the MPIfR, also a team member in the discovery…. Astronomers using NASA’s Hubble Space Telescope have found several examples of galaxies containing quasars, which act as gravitational lenses, amplifying and distorting images of galaxies aligned behind them. Quasars are among the brightest objects in the universe, far outshining the total starlight of their host galaxies. Quasars are powered by supermassive black holes. To find these rare cases of galaxy-quasar combinations acting as lenses, a team of astronomers led by Frederic Courbin at the Ecole Polytechnique Federale de Lausanne (EPFL, Switzerland) selected 23,000 quasar spectra in the Sloan Digital Sky Survey (SDSS). They looked for the spectral imprint of galaxies at much greater distances that happened to align with foreground galaxies. 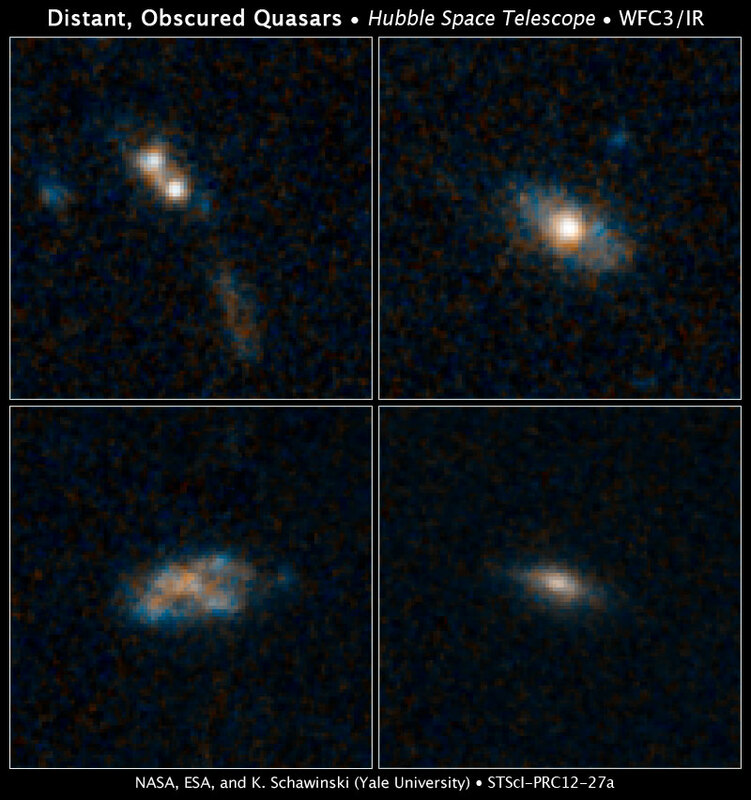 Once candidates were identified, Hubble’s sharp view was used to look for gravitational arcs and rings (which are indicated by the arrows in these three Hubble photos) that would be produced by gravitational lensing. Quasar host galaxies are hard or even impossible to see because the central quasar far outshines the galaxy. Therefore, it is difficult to estimate the mass of a host galaxy based on the collective brightness of its stars. However, gravitational lensing candidates are invaluable for estimating the mass of a quasar’s host galaxy because the amount of distortion in the lens can be used to estimate a galaxy’s mass. The next step for the team is to build a catalog of “quasar-lenses” that will allow them to determine masses for a statistically significant number of quasar host galaxies and to compare them with galaxies without quasars. With the numerous wide-field surveys that will start in the near future or that are already started, hundreds of thousands of quasars will be accessible for looking for lensing effects…..
Quasars are among the most energetic objects in the universe, with some of them as luminous as ten thousand Milky Way galaxies. Quasars are thought to have massive black holes at their cores, and astronomers also think that the regions around the black holes actively accrete matter, a process that releases vast amounts of energy and often ejects a powerful, narrow jet of material. Because they are so bright, quasars can be seen even when they are very far away, and this combination of being both highly energetic and located at cosmological distances makes them appealing to astronomers trying to figure out the nature of galactic center black holes (our own Milky Way has one) and the conditions in the early universe that prompt these monsters to form. Quasars, and other galaxies with less dramatic but still active nuclei, come in a variety of subgroups. Some, for example, contain hot gas moving at huge velocities, while others do not; some are seen with strong dust absorption features, but others are not. One problem in unraveling the mystery of quasars is that many (perhaps most) quasar nuclei seem to be surrounded by a torus of obscuring dust that makes them difficult to study. In fact, the standard model of these objects proposes that the various subgroups result from viewing the active nuclei at different angles with respect to its dusty torus. If the nucleus happens to be seen face-on, and if there is a jet present, the gas velocities are large and the dust is not apparent; if seen edge-on through the torus, the observed velocities are much smaller and the dust absorption features are dominant. But so far no one knows for sure how quasars form, how they develop in time, or how (or what) physical processes generate their stupendous energies. The situation may be about to change. The violent activity around a black hole is very difficult to analyze with just pen and paper, and so for years researchers have tried to use computer simulations to identify what happens. But these simulations have faced a major challenge: tracing the detailed flow of material from galaxy-wide scales of hundreds of thousands of light-years down into the central tenth of a light-year around the black hole. It has just been too hard to keep track of everything at such a fine scale across such a large one. CfA astronomers Chris Hayward and Lars Hernquist, together with ex-CfA member Phil Hopkins and a fourth colleague, have figured out a way to deal with the computational dilemma. They use a clever scheme of multi-scale “zoom-ins” which allows them to track and model, in a physically consistent way, selected parcels of gas as they move inward towards the torus. Their simulations lead them to reach two very significant conclusions. 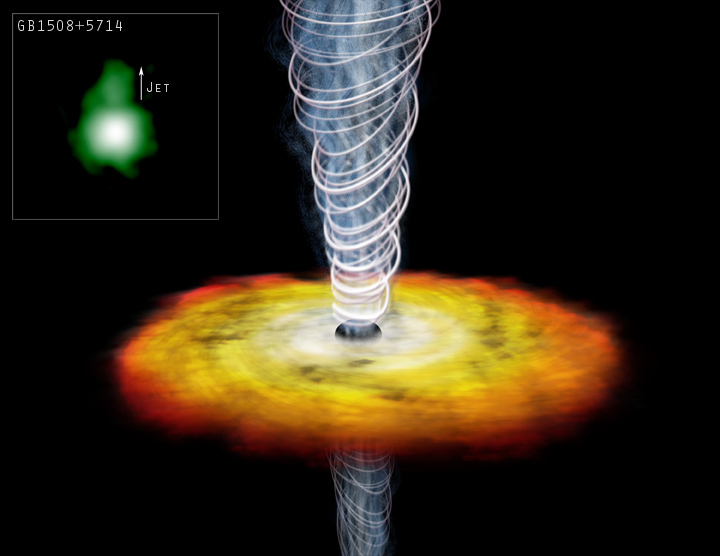 First, they show that a dusty torus is likely to be produced around the black hole – in the past it had been postulated in order to explain the various morphologies but had never been demonstrated, even in a simulation. Secondly, the scientists show that the torus is not just a passive screen: it plays an active role in feeding gas and dust into the accretion disk around the black hole itself. Mass and spin are often referred to as the two `hairs’ of astrophysical black holes, as they are the only two parameters needed to completely characterize them in General Relativity. The interaction between black holes and their environment is where complexity lies, as the relevant physical processes occur over a large range of scales. This is particularly relevant in the case of super-massive black holes (SMBHs), hosted in galaxy centers and surrounded by swirling gas and various generations of stars, that compete with the SMBH for gas consumption, and affect the thermodynamics of the gas itself. How dynamics and thermodynamics in such fiery environment affect the angular momentum of the gas accreted onto SMBHs, and hence black hole spins is uncertain. We explore the interaction between SMBHs and their environment during active phases through simulations of circum-nuclear discs (CND) around black holes in quasars hosted in the remnants of galaxy mergers. These are the first 3D (sub-)parsec resolution simulations that study the evolution of the SMBH spin explicitly including the effects of star formation, stellar winds, supernova feedback, and radiative transfer. This approach is crucial to investigate the angular momentum of the material that is accreted by the hole. We find that maximally rotating black holes are slightly spun down, and slow-rotating holes are spun up, leading to upper-intermediate equilibrium values of the spin parameter (~0.7-0.9). Our results suggest that, when quasar activity is driven by mergers of galaxies of similar sizes, stellar feedback does not induce strong chaos in the gas inflow, and that most SMBHs at the end of the quasar epoch have substantial spins….